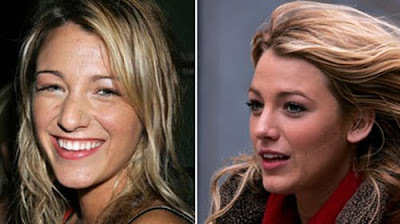 Blake Lively before and after nose job plastic surgery. Blake Lively is a budding celebrity actress, who you might know from the television drama Gossip Girl, or perhaps for her work in the movie The Sisterhood of the Traveling Pants, and more recently The Town. Regardless of how you know her, you've probably noticed a few things about Ms. Lively, that have changed since she found her way into the all seeing of the Hollywood spotlight. Just take a look at these before and after pictures of what appears to be a nose job procedure that trimmed, narrowed and redefined the tip of her God given nose. However much like with fellow actress, Scarlett Johansson, the surgeon had quite a bit of canvas to work with, so the end result wasn't shocking like many of the tiny little beak nose jobs, that we've seen all too much of in the past. 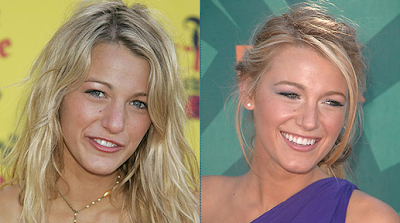 Stay tuned, because the nose job (rhinoplasty) isn't the only plastic surgery operation that Blake Lively is rumored to have undergone. That's right folks, we'll also take a look at the actresses ever increasing breast size. wow, i didnt know she had a nose job! Whoah! No denying that one...hope she kissed that surgeon! She`s still a butterface. Too horsy.